With UI and visual improvements. Back in prehistory (the PlayStation 2), two action RPGs came out that made great use of the Marvel license. Those games were X-Men Legends and X-Men Legends 2, and Marvel hasn't just announced it's re-releasing remastered versions of both games next Tuesday, for PC and the current consoles. No, we're getting Marvel: Ultimate Alliance and Marvel: Ultimate Alliance 2 instead, the pretty good, next-generational follow-ups that boshed in the likes of Iron Man and Captain America as well. As you might have guessed, the news comes out of this weekend's San Diego Comic-Con, along with a dozen exciting trailers for upcoming superhero films. 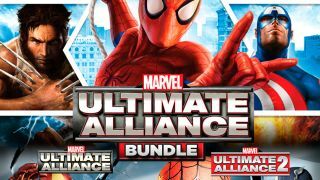 Marvel: Ultimate Alliance and its sequel will be available individually or in a double-pack this coming Tuesday, in digital form. For your $39.99/$59.99 for both, you're getting better performance, along with visual and UI improvements. There's no word on whether the games' reams of downloadable content will be included in the package, but on the plus side, M:UA Remaster executive producer Mike Jones has said that "anything is possible" regarding a third entry in the series.